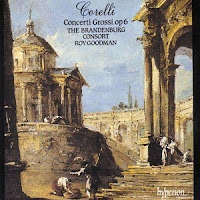 Decided to review (in both respects) Corelli's beloved Op.6 Concerti Grossi. Corelli was not the first to invent the concerti grossi form, nor was he credited for being the first to coin the term, but he is probably most monumental in establishing it as a leading form of music. Its popularity persisted in England long into the Classical era, with many other composers trying to compose this genre, the most successful composer being Handel of course. Since there is no shortage of Corelli's biography, I'm going to cut to the chase about the music and recording itself. My first exposure to the concerto grosso was a selection of Handel's op.6, played by an unknown group and unknown label which I have no recollection of anymore. 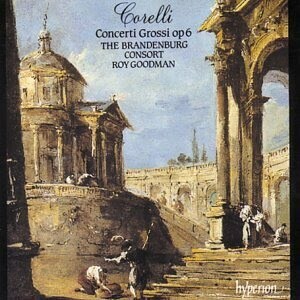 My first complete concerti grossi set that I bought was in high school when I bought Corelli's op.6 set of concertos. (Technically the first set was Geminiani's arrangement of Corelli's op.5) It was a set recorded by Academy of St-Martin-in-the-Fields directed by Sir Neville Marriner. As a modern instrument performance, it was overall a solid and consistent rendition, but more importantly, introduced me to Corelli's music in general. As my appetite for early music grew rapidly, I started to prefer period performances, and I set out to purchase period performances of Corelli's op.6. I have since bought 3 more additional recordings of it, but this version by the Brandenburg Consort is my first period performance, and upon listening to it again, it has continued to delight me in ways. The principal reason is probably the music itself. Corelli's music has a distinct unmistakable personal style, and I mean it in a positive way. Corelli generally avoids the virtuosic violin writing certain Italian or German composers have done so often. Instead, his musical line is smooth and melodic, in tune with the modern aesthetics of how we perceive beautiful music to be. His trademark "Corelli cadence" and other elements can be predictable at times, but it does not bother me quite so much. As for the playing, Goodman and the Brandenburg Consort go for a smaller ensemble and play on the brisker side. It is a light but considerably lively interpretation, which is contrastingly different from the sound that Banchini and her big Ensemble 415 produce, another recording which I own and equally enjoy. Goodman and Brandenburg Consort are vivacious but in a refined manner, and they do manage to sneak in some ornamentations on repeats. Their playing might not be as spontaneous as Biondi's Europa Galante, but they have a richer and cleaner tone that makes them hold their own against a great competition out there. 今天敗家亂買了5張CD, 大概被你帶壞(誤)啟發(正),所以竟然有兩張巴洛克音樂!! 一是vivaldi 四季+Corelli concerto op.6 NR4+Tomaso Albinoni的concerto a cinque,二是Bach的 BWV552,542,650與645.